At Tribal Impact, we’re focused on driving value from social interactions. Whether that’s better engagement, bigger sales or greater social impact, we are passionate about delivering business growth through employee social media conversations. SAP is renowned for being at the cutting edge of social selling and this doesn’t stop with their online presence. 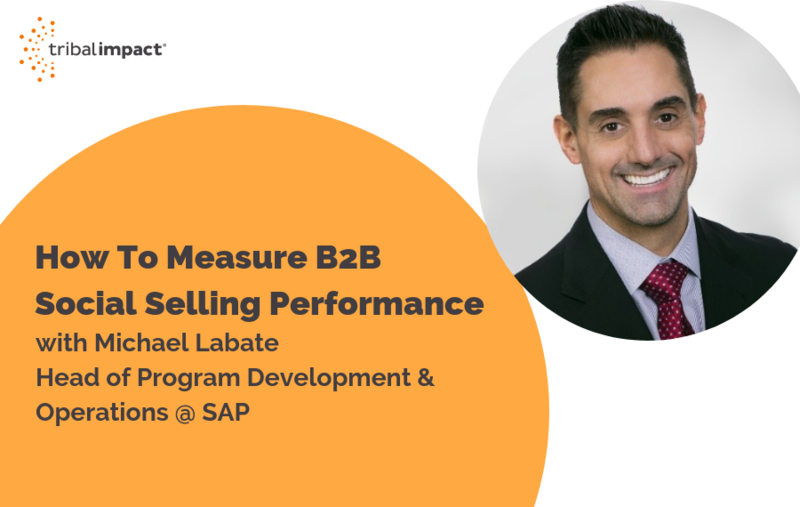 Tribal recently spoke to Michael Labate, who heads up operations and program development for SAP’s Global Social Selling Program, to learn about their ground-breaking innovation that introduces a new way to measure social selling’s ROI and business impact across the company. In fact, Michael will be keynoting at several conferences this year to unveil the methods behind the approach so that the wider sales enablement community can expand on the research and practices. It is now almost a cliché to state that buyer behavior has changed. We’re more than familiar with the statistics such as 70% of a buyer’s journey and up to 90% of the decision is made before customers are ready to talk to a vendor. But over the past few years, SAP has noticed another, perhaps more subtle, behavioral change. It involves buyers’ peers influencing the online narrative and it presents a real challenge for large organizations because it happens on very small scales, often within community discussions or in relation to very specific enquiries. Michael explained using a recent example SAP encountered. Successful Social Selling relies on the ability of organizations to be able to listen to trending topics and influence their target customers using their people who bring wider networks to bear and spread the brand messaging and capabilities in a credible and authentic way. But this particular enquiry was far more granular than anyone had considered. “Basically, a marketing demand agent or sales rep should have been creating a thought leadership presence around this topic – “moving legacy HR to the Cloud” – which might have caught the attention of this lower-level, early stage enquiry,” explains Michael. But the really interesting thing was the way the narrative played out next. For around 48 hours, none of the big brands or their representatives responded. Instead, the enquiry was jumped on by the authors’ contacts, her peer group. This small development made Michael start to think about the behavioral elements of Social Selling from the perspective of those building relationships. 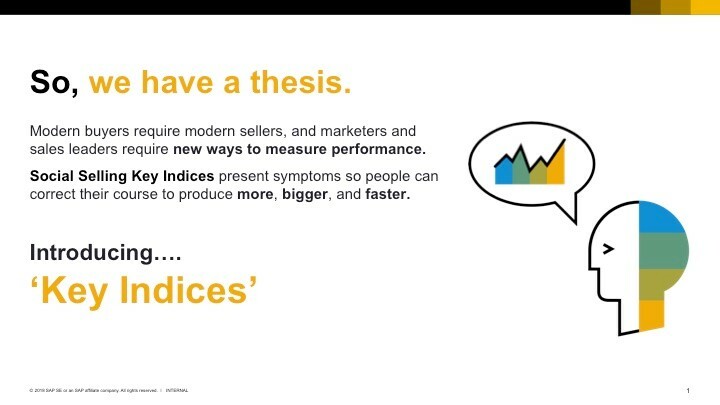 Michael set out to investigate a collection of buyer behaviors, from the buyer doing their own research to the significant downturn in responses to cold outreach calls and realized that such a pronounced change in behaviours needed to be reflected in the way SAP measured its success. 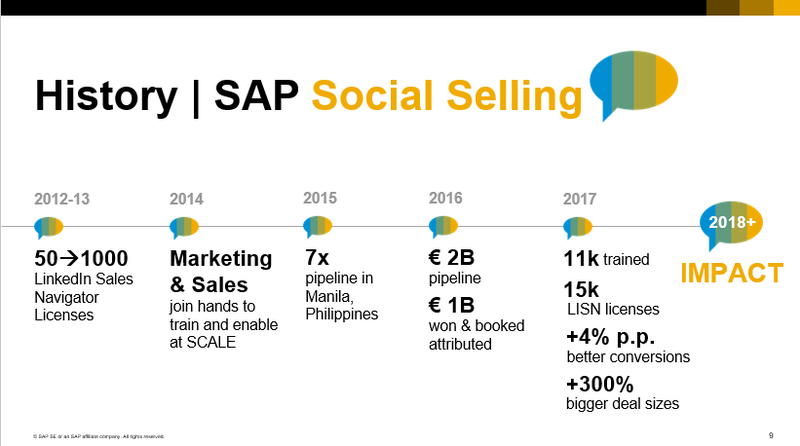 SAP has a great history, not just of evolving their Social Selling approach, but also of driving ever more incredible outcomes as a result of doing so. “Our thinking was whether, by creating indices, we could measure behavioral performance in the same way as the Equity markets measure performance of different sectors” Michael explains. The results, in true SAP style, have been compelling. The team is now at the stage where they can start to demonstrate the power of this new analysis. They are able to map and really dig out the detail of where underperformance is occurring and do something about it. 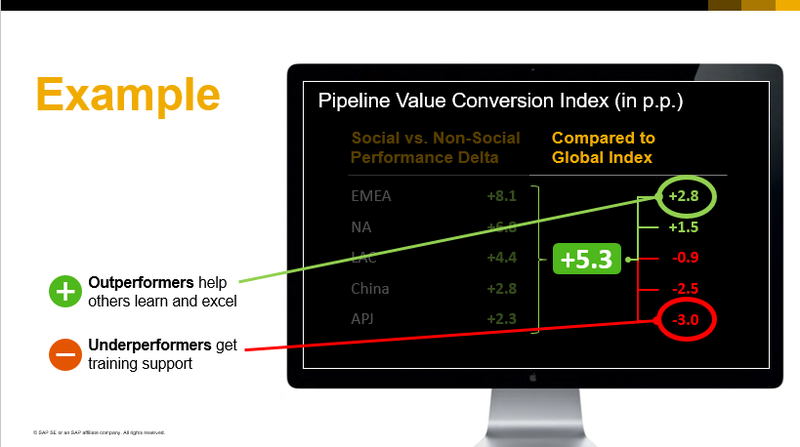 The team now needs to focus on embedding this new approach to measurement across SAP. The team plus some external community members will be delivering a keynote at the forthcoming ‘Enabling Customer Engagement’ Conference on the morning of Tuesday, September 18th. The conference takes place in Denver from 16th to 19th September and represents an opportunity for SAP to share its findings with a wider community. Michael will also be keynoting at the ‘Sales Operations Institute’ Conference in Atlanta, GA on October 8th.